So, on Friday night, my son Kelvin and I staggered into the con hotel with a massive pile of boxes containing zines, several fancy dress outfits and not a lot else. It was his first proper convention. (I refuse to count an incredibly boring Trek con I once took him to.) I distinctly recall getting changed into fancy dress and setting up my table in the dealer's room, but most of the rest of that evening has become a blank. I do recall meeting several e-mail friends that evening. I always wear fancy dress at cons; it's fun and it helps people recognise you. The cry of: 'Are you Judith Proctor?' was heard to echo down several corridors. I recall going to bed at a relatively sane hour (well all right, it was probably one or two o'clock, but this was a con). I tried to go to sleep. My room was in the 'quiet' part of the hotel, but some **** in the room next door had the TV set on loud (at 2am) and woudn't turn it down even when I knocked on the door. After the TV finally went quiet, I found I couldn't sleep because my nose kept running. Either I had a cold, or I was reacting to something. At about 3 am, in desperation, I staggered down to the hotel desk to ask if they had any cold cures. They didn't, but a group of fans just arriving produced some anti-histamine tablets. I'm sorry I can't remember who you were, because those tablets saved my con. The nose dried up and I slept. Next morning it was breakfast and zine selling. I've never seen zines go so fast. In fact I was selling them hand over hand all morning until things suddenly went quiet. After I'd recovered from the shock, I looked at the programme and realised the obvious: Paul Darrow was on in the main hall. The day developed into a juggling routine between managing the table, catching sessions I wanted to watch and joining in any that I was actually doing. At some point I joined my fellow contestants for the "Anorak Mastermind". Specialist subject: Blake's 7: the aired series. Other contenders had subjects including Red Dwarf, Eroica, Avon and Dr Who - The Pertwee era. Poor souls never stood a chance. I'd spent the last few months editing and proof-reading Neil Faulkner's Blake's 7 encyclopaedia. After surviving that, a set of B7 mastermind questions was almost a relief. Modest, that's me <grin>. Anyway, I am now the holder of the Golden Anorak Award! Later in the day was a panel discussing whether Blake would have been a good president. The voice proved to be an asset in an unexpected way here. As is my usual habit with debates, I offered before the con to take either side. I got given the 'Blake would be a bad president' side of the debate. As I knew in advance that I might not be able to talk, I spent some time writing up a list of notes for Val, in case she had to do it. As it turned out, I was able to croak well enough to do the session (I sounded rather like Katharine Janeway) But I had the advantage of all the notes I'd done. So, after happily ripping Blake to shreds, we more or less left it up to Gareth to try and justify Blake. In Gareth's own words (as well as I can remember) it was virtually the first time he'd ever had to take a really deep look into Blake and try to decide exactly why he did what he did, and how he felt about it. What emerged was a man with a very strong sense of commitment, a strong sense of right and wrong. A man who didn't want power himself, a statesman rather than a politician. A man who felt guilt for any deaths he might cause, but who could see no other way for achieving freedom for the oppressed masses. A man who gradually became bitter and twisted by the time of Gauda Prime as he realised that he could not win. He also commented that Blake might have (on some level) wanted to be a martyr by the time of GP. It's a way out, an escape, and leaves you with the illusion of having achieved something. I wish massively that this session could have gone on longer as it was becoming absolutely fascinating (I'm not the only one who found it so - several people spontaneously said the same to me), but unfortunately the room was needed. If anyone made a recording of this session, could they *please* contact me, as I know I haven't remembered all of it and it was extremely interesting. More zine selling, more things to do. In the evening there was the cabaret. Firstly, Gareth and Paul auctioned each other off for breakfast the following morning. The bidding, surprise surprise, went beyond my meagre budget, - Gareth went for � and Paul for �0. Paul did his Henry V extract that he did at Visions with the help once more of Sophie Aldred. That had some suitably hilarious moments with Paul hamming like mad. Gareth did a bit of Hamlet, but to my frustration I had to miss that as I'd been roped into the masquerade. (We're short of entires, would you like to take part?) Nothing ventured, nothing gained. I went on first as Blake, then while the others were taking their turn, I did a quick change act and came on last as Avon. 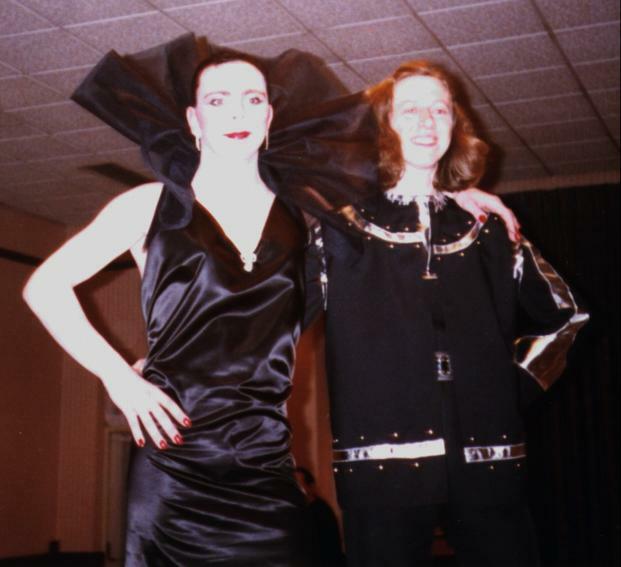 No, I didn't win that, but Kelvin did (and on his own merits too, as the costume made him look so tall that he got counted in the adult section) The performance prize went to David as Servalan. The general standard of the entires was excellent. The other winner was Will Blight with a borg style Travis. After that came a wonderful fan musical following the fortunes of Blake and his crew (Blake with his curly wig had a flipover name tag hanging round his neck and changed into Tarrant half way through the show). Avon was particularly well voiced and it was obvious a lot of work had gone into this performance. After that came the slash turkey read late at night, followed by the even later filk session. I think the filks were my downfall in retrospect. I cannot resist a filk session as anyone who knows me will testify. Unfortunately, singing when you have almost lost your voice, tends to complete the process. After the filk session ended, I seem to recall talking to Neil and Russ until around 4 in the morning. I was at the scribbling notes on pieces of paper stage by now, but it was fun anyway. Staggered off to bed with another anti-histamine tablet. By morning, I'd recovered enough voice to be able to whisper. I may not have got Gareth in the auction, but my breakfast stand-in sportingly managed a passable Welsh accent. Thanks Steve. More zine selling. Sold out of several titles, managed a brief visit to Horizon shop to stick up on memo pads, photos, etc. and to drool over original Liberator which was strategically placed in the window. Later on I did a fan writing workshop. That finished off the voice totally and utterly. By the end of the session I was relying pretty heavily on Neil and mainly acting as chairman by banging a bottle if anyone waffled on for too long. We got through a fair bit of interesting discussion on ways of developing plots, handling points of view, etc. My pile of paper was running low by now. Do you know how frustrating it is to have a witty reply for somthing and by the time you've written it down and passed it to someone else to read aloud, the moment has already passed? Still, it was fun. I'd be hard put not to enjoy myself with Gareth around. After that, I sold a few more zines and then packed the rest away as the dealers' room was due to shut. Besides, I'd sold out of five titles by then. If I'd known so many people wanted 'The Totally Imaginary Cheeseboard' and 'The Other Side of the Coin', I'd have printed more. I thought nearly everyone already had them, but I was wrong. I'll be doing another batch shortly for anyone who wants to mail order them. Refractions #1 is now out of print in the UK. 'The Road to Hell' and 'Sevencyclopaedia' will be back down the copyshop as soon as I've caught up on my sleep. The closing ceremony was fun. I'd won two prizes, so I got to be hugged by both Gareth and Peter Tuddenham. Peter's getting on though. I had to catch him when he stumbled. After that came the Rocky Horror Show. I dipped out on that, although I did see some great costumes passing through the bar. Given that I was only actually drinking water (a. because I object to hotel booze prices, and b. beause anything else would probably have irritated my poor throat even further), what was I doing in the bar? The answer is fairly obvious to any regular con goer. If you are looking for Gareth Thomas at a convention, you look in the bar. (And that conversation is definitely on the other list too). I also caught up with Neil and Russ and Val and Nicoline and Monique and happily discussed women in B7 and other B7 topics into the wee hours of the morning. It is so nice to be able to discuss your main obsessions in life with other people who share them. I'm an anorak, and at cons I'm a *happy* anorak. Overall, this was quite simply the best con I have ever been to. The guests were great. The hotel was excellent (the foyer layout was particularly suited to casual gatherings of fans. The bar was well ventilated (if you're an asthmatic, Gareth Thomas fan, this is a serious consideration) The food was good. The con programme had loads of variety and lots going on. I was never felt bored for moment and that counts double given that I was totally unable to talk by the end. Many thanks to all those who organised and took part in it.